All wars are fought again in retrospect as the tactics, victories and losses are reviewed for whatever lessons can be learned. For anyone who had any reservations about the U.S. invasion of Iraq in 2003, Breaking Iraq: The Ten Mistakes That Broke Iraq ($28.95, History Publishing Company) by Col. Ted Spain, U.S. Army (ret) and Terry Turchie, Asst. Deputy Director FBI (ret) will either confirm your worst fears about it or open your eyes to what occurred in the first year of the war. The primary voice, Col. Spain, was a commander of the military police brigade that was primarily responsible for restoring security for both U.S. forces and the Iraqis in the wake of the initial success of the “shock and awe” campaign that put our forces in Baghdad shortly after the invasion began. What Col. Spain found was evident to those of us sitting safely at home in front of our TVs. Baghdad and the rest of Iraq was in a state of chaos in the absence of the brutal Saddam Hussein regime. There was extensive looting and criminality. If that wasn’t bad enough, the war was a logistical mess for our troops, some of which were wearing Vietnam-era flak jackets. 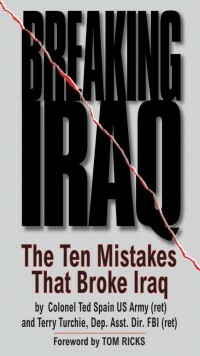 The authors meticulously report the events of that first year in which Col. Spain interacted with the highest levels of command in Iraq while wondering how stupid those back in the Pentagon and even the White House could be given the internal warring factions, the lack of law enforcement, and the insurgency that followed in the wake of the invasion. This book makes a major contribution to understanding the war. Like most people I only pay attention to the Supreme Court when there is a critical case before them. It has a long history of making both some good and some very bad decisions. For those who find the law of interest, Murder at the Supreme Court: Lethal Crimes and Landmark Cases by Martin Clancy and Tim O’Brien ($26.00, Prometheus Books) will prove a rewarding read. As they note, in 1969 the Court cast votes in secret that could have signaled the end of the death penalty, but later the justice’s resolve began to unravel. The two authors, both journalists, pull back the curtain of secrecy that surrounds the Court’s deliberations and reveal crucial links between landmark capital punishment cases that the lethal crimes at their root. These are the cases “that made the law” defining the parameters that judges must follow for a death sentence to stand up to an appeal. What we learn is that those subject to that decision have often been the subject of child abuse, often black, often poorly educated, and often poorly represented by their lawyers. The issues involved are often difficult to parse, both morally and legally. The way things are today, a condemned killer is more likely to die of old age on death row than to be executed, with the exception of the State of Texas. One of my favorite authors is Mark Twain. 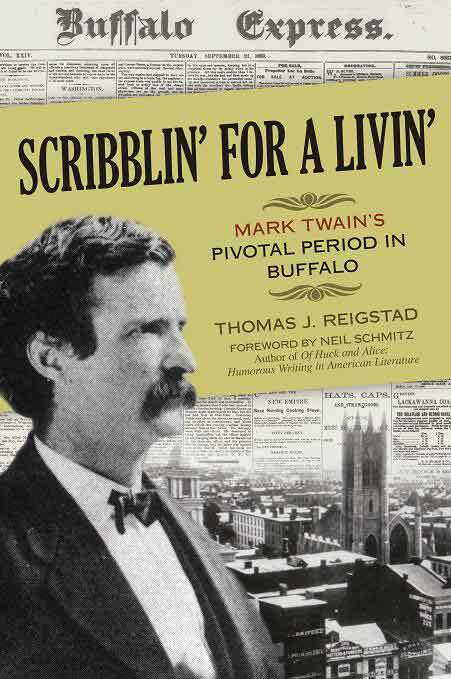 Thomas J. Reigstad has written Scribblin’ for a Livin’: Mark Twain’s Pivotal Period in Buffalo ($19.00, Prometheus Books, softcover). In August 1896, a 33-year-old journalist named Samuel Clemens moved to Buffalo, New York, with high hopes of becoming a successful newspaper editor of the Buffalo Morning Express in what was a thriving, up-and-coming metropolis at the end of the Erie Canal. Reigstad, a Twain scholar, details the domestic, social, and professional experiences of Twain when he lived and worked there. Twain would go on to become one of the nation’s most famous and successful authors, but his formative years are of interest and I think any of his fans, as well as students and scholars of American literature will find this treasure trove of information about his years in Western New York worth reading. People who write for a living love good similes that paint a big picture in a few words. Everyone uses them when they say things like “strong as an ox” or “busy as a bee.” Happily, the second edition of the Similes Dictionary, edited by Elyse Sommer, ($29.95, Visible Ink Press) has been published and it is packed with imaginative phrases on all subjects. It cites more than 2,000 sources from the Bible, Socrates, Shakespeare, and, yes, Mark Twain. Keeping it handy can make anything you write sparkle and is a useful tool for students, speakers, teachers, lawyers, and politicians, among others. It is a great aid to those seeking a quotation and well-turned phrase. How often I look back at my youth and formative years and wish--beyond the excellent upbringing of my parents--that I could have unlocked the secrets of creating and maintaining good relationships with others. As often as not, we all make mistakes and, if this is your concern as well, I recommend you pick up a copy of Cue Cards for Life: Thoughtful Tips for Better Relationships ($12.95, Hunter House, softcover) by Christina Steinorth, a licensed psychotherapist and Board Certified Diplomate in professional counseling. For more than a decade of private practice, she has helped hundreds of people heal their relationships. The “cue cards” in this excellent book offer a variety of behavior and attitude changes that can make anyone’s life go smoother. She advises that we master three basic tools for any good relationship; listening, managing feelings, and being sensitive. It’s not always ease in a society where “I come first” is often the unspoken message. Her book will help you keep from hurting another’s feelings, saying something hurtful or that we don’t mean, or failing to say or do the right thing. You will learn how to navigate perplexing family challenges, from births to deaths, and deal with aging parents, in-laws, and other loved ones. You will learn to engage in meaningful talk with your kids—especially teenagers—and communicate effectively with bosses, employees, and coworkers. You will sail through awkward parties and intimidating public events. I am inclined to think that, after reading this book, your life will become a lot easier in many ways. A useful addition to “Cue Cards” is “Why Do I Feel This Way?” What Your Feelings Are Trying to Tell You by Dina L. Wilcox ($16.95, Mill City, softcover). The author takes on the life of the brain on behalf of non-scientists like herself, answering questions of why we do what we do, blending humanistic psychology with brain science while sharing her own life with a deeply personal story of the feelings that haunted her after the death of her husband from AIDS during the height of that epidemic. This is a book about how we talk to ourselves through our memories, our fears, our loves, in our quest for happiness. If you find yourself asking yourself the question posed by the title, you should read this book. Uncle Billy’s Grim, But Wholesome Bedtime Stories (with a Smidge of Poetry) by B. Oscar Overbeck ($25.00, Charing Cross Press, Ann Arbor, MI) is now in its third edition and would normally be in the “Novels” section of Bookviews, but it deserves special mention as a collection of twenty-two short stories in which the talented author blurs the line between reality and make-believe, all inspired from his personal life. He farmed for twenty-five years and ran a gift store for ten. Natives of Nebraska, he and his wife moved to Colorado Springs, where he returned to his greatest gift, writing from his unique point of view, but you will find influences ranging from Stephen King, the Brothers Grimm, Dr. Seuss, and Rod Serling in these stories. You will congratulate yourself for “discovering” him along with many others who have had that pleasure. You can check it out at www.UncleBillystories.com. I confess that, for me, Bunker Hill, has just been the name of the opening battle in the U.S. Revolution, following the skirmishes at Lexington and Concord. I did not know much more about it than that. 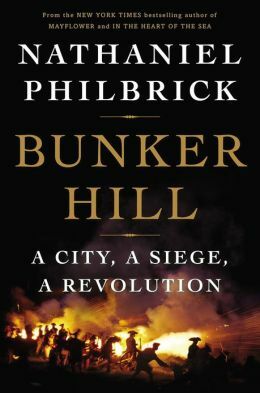 Happily, Nathaniel Philbrick has filled in that gap with Bunker Hill: A City, A Siege, A Revolution ($32.95, Viking), providing the reader with an understanding of the events and personalities that were the real origins of the war that led to the establishment of America. It goes beyond the Founding Fathers, the Declaration of Independence, and the usual elements we are taught in school, focusing on the decades-long struggle that led a group of merchants, farmers, artisans, and sailors to take up arms against their own country the most powerful empire of its time, England. Boston was already a city of 15,000 and the tension that built up climaxed in June 1775 with the Battle of Bunker Hill. The book’s special appeal is the way Philbrick has brought the story alive, making it an exciting tale about the arrogance of the British who kept imposing taxes and penalties on Boston, the Tea Party, and increasing incidents that enflamed not only its citizens, but the many Massachusetts communities adjacent to it and ultimately all of the colonies. The personalities involved, both American and British are brought to life again, the events and preparations leading up to the battle, the spies, and ultimately the battle and the Revolution combine for a compelling, exciting story. George Washington and Thomas Jefferson have become mythic figures in America’s history, but we tend to forget that they were flesh-and-blood men whose acts and decisions not only gave birth to the nation, but shaped its history to come. 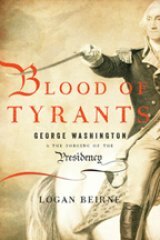 Blood of Tyrants: George Washington and the Forging of the Presidency ($27.99, Encounter Books) by Logan Beirne reveals how Washington created the template by which future presidencies would function, dealing often with many of the same problems. When should military tribunals be used instead of civilian trials? How should enemy prisoners be treated? How should citizen’s rights be protected when the nation is struggling to defend itself? One of the best aspects of this book are the vivid stories from the Revolution, many quite different from what most of us learned in school or even college. They set the stage for Washington’s pivotal role in the drafting of the Constitution and his dogged pursuit of the war against the British despite daunting problems and odd, not the least of which was the congressional committee. Only Washington’s steely character and strong moral beliefs got us through to victory and beyond. The author is an attorney with impressive academic credentials. He is the Olin Scholar at Yale Law School. Readers will profit from reading this excellent book. Framing a Legend: Exposing the Distorted History of Thomas Jefferson and Sally Hemings by M. Andrew Holowchak ($25.00, Prometheus Books) adds a new chapter to the debate over the relationship between Jefferson and a slave and rebuts the claim that he fathered one of her children. Suffice to say it challenges many of the accepted “truths” developed by who have advanced this story, bringing a penetrating, critical perspective to the question of Jefferson’s paternity, his racial attitudes, and other aspects of the legend. The last two decades of the Soviet Union and the Russian Federation that replaced it as seen by Dmity Rogozin can be found in The Hawks of Peace: Notes of the Russian Ambassador ($28.20, Glagoslav Publications). Written, of course, from a Russian point of view, it provides lots of insight into the way the events and personalities leading up to the collapse of the USSR played out. Rogozn is a Deputy Premier of Russia and had a front-row seat at the events and the people involved. His book shares his evaluation of them and provides a look at post-Communist Russia. A former Permanent Representative of Russia to NATO, he reflects on the complex relationship of Russia and the West. His book addresses his view of men like Gorbachev and Yeltzin, the political stand-offs and military conflicts, and sheds light on the terrorist acts and hostage situations that occurred during the Chechen War. For the Western reader it demonstrates how a Russian nationalist and patriot saw the world and his nation, and interpreted it. Suffice to say, it is well worth reading. 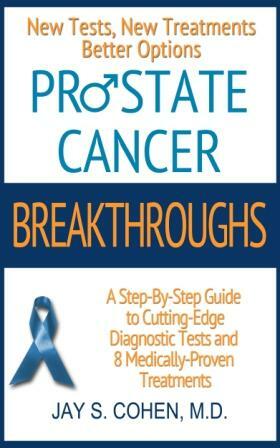 A health problem that affects many men is addressed in Prostate Cancer Breakthroughs ($12.95, Oceansong Publishing) by Jay S. Cohen, MD. As he notes, “A quiet revolution in the diagnosis and treatment of prostate cancer is underway, but many doctors and most men diagnosed with prostate cancer have not heard about it. Instead, today men are quickly dispatched for aggressive treatment such as prostate surgery or radiation, both of which can affect men's sexual or bladder competence permanently. The numbers are startling: 85% of men diagnosed with prostate cancer get surgery or radiation, yet only 15% actually need it.” Prostate cancer is the most common cancer in men and the author takes readers, step by step, along a better path to a cure, introducing a new diagnostic process than enables doctors to differentiate dangerous prostate cancers from non-threatening ones while detailing four new treatment methods designed to target different types and various stages. The author was diagnosed with this cancer in December 2011 and it led him to undertake the research that results in this very useful book. From Central Recovery Press, a publisher that focuses on various elements of medical and psychological care, come two books that will prove useful. Some Assembly Required: A Balanced Approach to Recovery from Addiction and Chronic Pain by Dan Mager ($16.95, softcover) an instructive story of his own struggle with addiction and chronic pain. A behavioral health professional, he documents how these problems spiraled out of control and presents a model for recovery from both life-altering conditions. This is a warning against the fastest-growing drug problem, addiction to so-called pain-killers. I have no doubt this book will prove helpful to anyone encountering these problems. Why Can’t My Child Stop Eating? A Guide to Helping Your Child Overcome Emotional Overeating by Debbie Danowski, PhD, looks at food addictions, offering real-world solutions to the social, emotional, and physical problems of obese and overweight children and their families. It arrives at a time when more and more people are aware of this nationwide problem in their own lives and those of others. What Did You Say? An Unexpected Journey into the World of Hearing Loss ($16.95, Two Harbors Press, softcover) addresses a problem affecting an estimated 48 million Americans over the age of 12 who have had hearing loss in one or both ears. Monique E. Hammond, RPh, has worked in health care in Europe, the United States, and Australia. This is, in part, her personal story in addition to being an educational guide for anyone who is or who knows someone who is experiencing hearing loss. It examines basic hearing and emotional implications as well as checklists for preparing to meet with specialists. This book will help millions like her. Alive Again: Recovering from Alcoholism and Drug Addiction by Dr. Howard C. Samuels with Jane O’Boyle ($24.95, Wiley) The author knows about this subject because his first arrest for drug possession was at age 17 and he struggled with his addiction until conquering it in 1984. He has since gone on to become one of the nation’s experts on the subject, running the Hills Treatment Center in Los Angeles. He shares the program that saved and changed his life and anyone seeking to escape these additions would do themselves a big favor if they read this book cover to cover. Eating Expectantly: Practical Advice for Health Eating Before, During and After Pregnancy by Bridget Swinney, MS, RD, is now in its fourth edition ($19.95, Healthy Food Zone Media, softcover) so you know it has been tested and its advice works. There are more than 120,000 copies in print. The new edition has been thoroughly updated and expanded. Eating properly can contribute to the newborn’s health and not doing so can “program” them for problems that include diabetes, high blood pressure, and asthma. When first published, it was selected as one of “Child” magazine’s Top Ten Parenting Books of the Year. This nutrition expert has done a lot of mothers and their children a big favor with this excellent book. The flip side of eating too much is eating too little or anorexia, a condition in which the individual is obsessed with being thin. Emma Woolf has written a memoir, An Apple a Day, ($16.95, Soft Skull Press, softcover) about her addiction to hunter, exercise and control, a full-fledged disorder, while also managing a successful career. The title comes from what she often ate daily and nothing else. At age 32, after a decade of hiding the truth, she had met the man of her dreams and decided it was time to start living a normal life. This is a life-affirming story and one that would help anyone with a similar disorder, as well as those in the medical and mental health professions to provide some valuable insights. It is well worth reading. The gift of memoirs is the way they provide a look into our own lives. 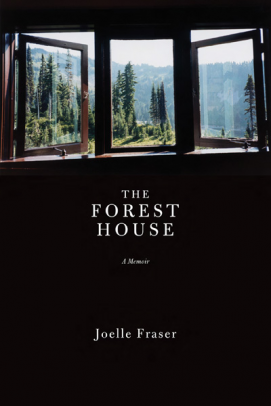 The Forest House: A Year’s Journey Into the Landscape of Love, Loss and Starting Over by Joelle Fraser ($16.95, Counterpoint Press, softcover) in which she shares her life after her divorce. She was determined to ease her young son’s transition to joint custody by staying near her ex-husband, moving to the closest far-away place she can find, a one bedroom home off a one lane road tucked deep in the forests of the Sierra Nevada Mountains. This is her story as she starts to rebuild her life, finding solace in the passages of her favorite books, strength from researching her fascinating family history, and peace, in rescuing and rehabilitating injured animals. Ultimately she learns to accept her choices and discovers gratitude, strength, and resolve beneath her pain. Any newly single parent will find much to learn and enjoy in this memoir. In a similar fashion, Dena A. Bedsole offers her story in A New View of an Old Horizon ($14.95, softcover), a personal account of a daughter’s quest to discover herself in the wake of her father’s battle with pancreatic cancer. This is her account of a yearlong journey to find a new balance between her life as a wife and mother, and caring for her dying father. It is a heartfelt story told with raw honesty, the kind we all need to cope with loss and go on living. Love with a Chance of Drowning by Torre DeRoche ($14.99, Hyperion, softcover) is an entertaining memoir by an Australian city girl with a morbid fear of deep water who fell in love with an Argentinian man with a sailboat and a dream of setting off to explore the world. Soon enough she has to confront a decision of either watching the man she loves sail away forever or head off on the journey with him. Her memoir is of a year-long voyage across the Pacific. These days they live together in Thailand in a $5-a-night bungalow with a million-dollar view. Letters from the Closet by Amy Hollingsworth ($19.99, Howard Books, a division of Simon and Schuster, softcover) is the story of a deeply intimate yet platonic relationship between a gay high school English teacher and his young protégée—each seeking connection and acceptance—as reflected by the decade of letters they exchanged. They were a treasured connection that was locked away for years and a poignant commentary on the values that unite us all. This is a look at an era when many homosexuals were still “in the closet.” The author wrote for eight years for the “The 700 Club” and holds a degree in counseling psychology, along with a degree in both English and psychology. Those who love basketball will love the story of former NBA star, Anfernee “Penny” Hardaway as told in On These Courts: A Miracle Season that Changes a City, a Once-Future Star, and a Team Forever as told by Wayne Drash ($26.00, Touchstone, an imprint of Simon and Schuster). Hardaway grew up in Binghampton, a rough section of Memphis, but his talent as a basketball player and the values imparted by a no-nonsense grandmother, kept him away from the gangs and drugs in the neighborhood. Everyone was sure he was the next superstar player, but he was plagued by injuries and eventually returned to Memphis wondering what he would do next. An old friend, diagnosed with colon cancer, needed someone to replace him as head coach of the Lester Middle School team. He coached them to their first championship win, but he did much more, helping them cope and overcome the challenging environment in which they lived. This is a story of hope and inspiration, of struggle and triumph. It helps that its author, a senior producer for CNN.com, was named one of the best online writers in America who, as it turns out, also coaches a grade-school basketball team in Atlanta. There are books that do not fit into any particular category and are unique for their topic or some other aspect. 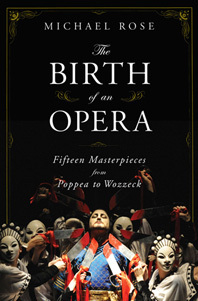 One such is The Birth of an Opera by Michael Rose ($35.00, W.W. Norton) which will surely please fans of opera with its stories behind the creation of fifteen operas by composers that range from Mozart to Beethoven, Bizet to Alban Berg’s “Wozzeck”, a span of four centuries. Rose drew on correspondences between composers, librettists, performers and critics to take the reader behind the scenes to tell the stories of how fifteen operas came to be created and the travails, luck and genius of those who undertook these challenging projects. Even someone who has never seen an opera would find these stories interesting. In the early nineteenth century opera was considered the best road to worldly success for a composer, but just imagine what it must have been like to merge music, a libretto, stagecraft, and drama all in one. Beethoven was writing “Fidelio” as his hearing began to fail and Bizet would die shortly after “Carmen” debuted, never to know what a success it would become. We can all use a good laugh. Humor is great medicine and blows away our daily cares. Mary I. Farr is a health care marketing executive who is also the author of four books, the most recent of which is Never Say Neigh ($12.95, Two Harbors Press, softcover) in which the narrator is a handsome American quarter horse, Noah Vail, but Noah is no ordinary horse. After a brush with fame on an Oklahoma race track, he turned to blogging and has a large Face Book fan club. Mary is his assistant and together they motor around in his Comfy Sundowner trailer as he hosts cribbage tournaments and offer his views on human behavior, the economy, and dishing out horse hilarity as he views the world through equine eyes. It is a wonderful book, but especially for anyone who loves horses. There’s lots of humor to be found in My Planet: Finding Humor in the Oddest Places by Mary Roach ($14.99, Reader’s Digest, softcover). She has a sharp eye for our various forms of neurotic behavior, whether it’s hypochondriacs, hoarders, or compulsive cheapskates. The book is a tonic as she describes marriage as “a unit of people whose sleep habits are carefully engineered to keep each other awake” referring to her husband as “the man I call Ed.” Married couples will find a treasure of shared experiences, but Ms. Roach ranges widely with a sharp, often sarcastic, eye over the landscape of human behavior as it confronts our daily challenges. It’s a real treat. Sidney Lea is an American poet, novelist, essayist, editor and professor who is currently the Poet Laureate of Vermont. He has taught at many of the Ivy League colleges and his work appears in forty anthologies. His latest book is A North Country Life: Tales of Woodsmen, Waters, and Wildlife ($24,95, Skyhorse Publishing). His book will especially appeal to sportsmen and women who love the outdoors and notes the loss of crucial mentors who shaped his life, a lost generation of those who could turn their hand to anything from cooking without electricity or gas, to dressing wild food, or to carpentry. He has spent his life as a hunter, angler, and paddler, evoking the forests and waters of upper New England and the lives of a cast of characters who come alive with his skillful prose. This book is an elegy to those in tune with nature. People who share his love of nature will especially enjoy this book but even a city born and bred reader will find it a great reading experience. 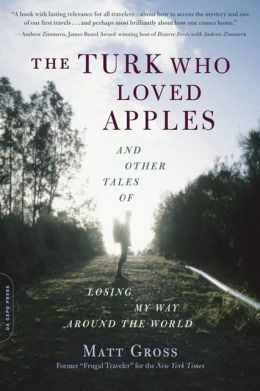 The travel writer, Matt Gross, offers essays on his adventures in The Turk Who Loved Apples and Other Tales of Losing My Way Around the World ($15.99, Da Capo Press, softcover). It is a celebration of independent travel and begins with his first trip as a young child in the back seat of his family’s station wagon through New England. His travels have afforded him a wealth of stories, taking him from Third World countries to fabled European ports. Along the way he met a rich variety of people and include discovering a “nudie beach” in the Gulf Islands of British Columbia to being taken in by a Slovakian family on a rainy night. Gross is a graceful writer whose has penned nearly 200 article for The New York Times travel section, including his columns, “Frugal Traveler” and “Getting Lost.” He is the editor of BonAppetit.com and lives in exotic Brooklyn with his wife and daughter. It took me a long time to acquaint myself with the Greek philosophers, discovering how much they knew millennia ago and how much of what they knew applies to our lives today. Aviezer Tucker has done us a favor by writing Plato for Everyone ($21.00, Prometheus Books, softcover) in which he recasts Plato’s dialogues into accessible and entertaining short stories in modern settings. “Euthyphro” becomes a story of a televangelist bent on disowning his son at a denominational boarding school in rural Virginia and “Crito” is retitled “What have you done for your country?” as a U.S. citizen considers a current war unjust and contemplates avoiding the draft by moving to Canada. Need it be said that the author has taught philosophy at universities around the world and is currently teaching at the University of Texas-Austin? The big questions, what is good and bad, what is virtue, and what constitutes a meaningful life were addressed by Plato and are recast in this entertaining and enjoyable book. When it comes to “odd” The Resurrectionist: The Lost Work of Dr. Spencer Black by E.B. Hudspeth ($24.95, Quirk Books) certainly fits that description. It is a work of fiction and art by the author who asked himself, if angels were real physical beings, how would their wings be attached? An artist and sculptor, he began to create anatomical images of fabled creatures like the sphinx, sirens, satyrs, and others, creating the character of Dr. Black to pull them together in the book as a kind of biography. It is a significant work of imagination, though it may not appeal to a wide audience given the bizarre images. If you’re into skeletons and musculature, this odd book will provide ample entertainment. One of my special friends is Tania Grossinger, a longtime fellow member of the American Society of Journalists and Authors. 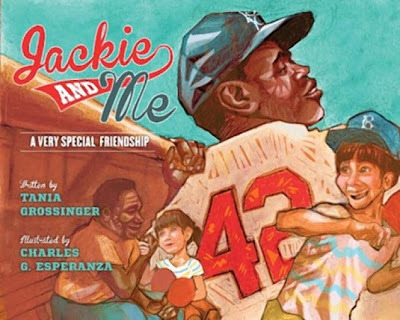 Little did I know that one of her friends when she was a young girl and for years thereafter was the baseball legend, Jackie Robinson. She met him went he and his wife visited Grossinger’s, a famed Catskills resort run by her cousins; many celebrities would spend time there. Jackie and Me: A Very Special Friendship, illustrated beautifully by Charles George Esperanza, ($16.95, Sky Horse Press) is ideal for young readers ages 5 to 8. It is the story of when they met first in 1951 when Tania was 13 years old; a girl who felt out of place and insecure much of the time. Jackie saw something special in her and invited her to play a game of ping-pong when he learned she liked the game. In time she would learn he was the first African-American to play in the major leagues as a member of the fabled Brooklyn Dodgers. He knew what it felt like to feel out of place, but he also was secure in his skills and blessed with character and a personality that won over fans. They would stay in touch over the years until his passing in 1972. This is a wonderful story, simply told, and a great tribute to a great man. A young set, ages 3 to 6, will thoroughly enjoy It’s a Firefly Night by Dianne Ochiltree ($12.99, Blue Apple Books) demonstrates her great talent as a writer for children. With art by Betsy Snyder it uses simply rhymes to tell the story of joy of capturing fireflies and letting them go. It is a lovely story for a parent and child to share, most likely at bedtime, capturing the simple, unforgettable fun and unforgettable memories of childhood. For the child learning numbers there’s Flowers by Number written by David Shapiro and illustrated by Hayley Vair ($14.95, Craigmore Creations) for those aged 4 and up. It starts with zero and counts up to ten while showcasing a different flower with each number. Sometimes readers count the petals or flower parts, or the flowers themselves. So they learn counting and the names of various flowers at the same time. It is an intriguing way to learn these things. Another counting book is National Geographic Little Kids Ocean Counting by Janet Lawler with photos by Brian Skerry ($16.95, National Geographic) and while the “flowers” will appeal to little girls, this one will appeal to both girls and boys, ages 4 to 6. The photos are excellent as one might expect of a National Geographic book and the text is an enjoyable learning experience. Also from National Geographic is The World is Waiting for You by Barbara Kerley ($17.95). With sparse text and eye-catching photos, this book invites the reader to explore the world around them including the sky above them. It is a spur to the tiny adventures that make up childhood no matter where the reader, ages 4 to 6, may be. I don’t know if more novels are being written and published these days, but it sure feels that way. They pour into the Bookviews office and the best one can do is select those that one feels will prove entertaining to someone. Like werewolves? 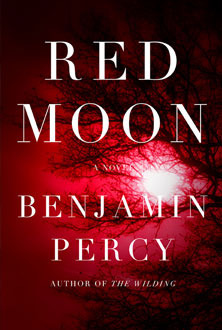 If so, you will like Red Moon by Benjamin Percy ($25.99, Grand Central Publishing). The novelist John Irving praised this novel saying, “Red Moon is a serious, politically symbolic novel—a literary novel about lycanthropes. If George Orwell had imagined a future where the werewolf population had grown to the degree that they were colonized and drugged, this terrifying novel might be it.” This is straight out of the classic horror genre, combining both the familiar and the frightening. This novel with its unforgettable characters, grisly action, and powerful storyline is hard to put down. Now let’s turn 180 degrees for a novel filled with magic and enchantment, drawn from the Afghani culture, a narrative interlinked stories rooted in fact and laced with magical realism. The Honey Thief by Najaf Mazari and Robert Hillman, the former who fled Afghanistan in 2001 for Australia and the latter, a Melbourne-based writer, conjures up a cast of characters such as a grief-stricken boy who finds his way back to happiness as the apprentice to a master beekeeper. There’s a musician capable of conjuring stones to rise into the air with the beauty of his playing who teaches his art to a mute child. These are just two that you will meet as your knowledge of Afghanistan today will be transformed from the dry headlines of war. Other novels fill familiar genres such as Bolero: A Nick Sayler Novel by Joanie McDonell ($14.95, Thomas & Mercer, softcover). A private investigator, an orphaned former junkie, gambler, and petty thief, Nick has turned his life around is living the good life, solving cases for a long list of wealthy and appreciative clients. His nights are spent on the “Dumb Luck”, a luxurious converted barge anchored in the Hudson River. He is plagued thought by memories of the beautiful woman whose killing he failed to stop a decade earlier. When an emergency call comes in late one rainy evening, it sets in motion a series of events that could finally bring about his redemption—or lead to his ruin. The law is at the center of A Case of Redemption by Adam Mitzner ($26.00, Gallery Books) by Adam Mitzner who is an attorney living in New York City. We meet Dan Sorenson who was once a high-powered New York defense attorney until a horrifying accident killed the two people in his life who meant the most to him. He hits bottom, but is offered the opportunity to defend an up-and-coming rapper in a murder trial on the front page of every newspaper. His client swears he’s innocent of killing his pop star girlfriend and Dan believes him, but as he delves deeper into the case, a successful defense may come at a high price. It is a real thriller that lovers of legal dramas will enjoy. The world of mega-churches is the backdrop to Pastor’s Wives by Lisa Takeuchi Cullen ($16.00, Plume, softcover). When the then-Time magazine reporter attended a religious retreat on a story assignment, she had no idea what to expect. What she found was that life as a pastor’s wife was more complex than imagined. This novel has been praised as “a terrific first novel, fast-paced and fresh” as it follows three women whose lives converge and intertwine at Greenleaf, a Southern evangelical mega-church. Suffice the say they all come together from very different points of view and life experiences. Each will end up asking what is the price of loving a man of God? There is a lot here to enjoy and it is never boring. 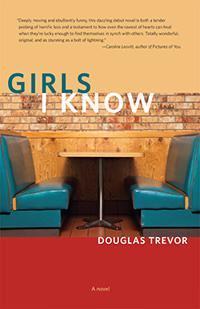 Relationships are at the heart of Girls I Know by Douglas Trevor, a Hemingway finalist, (SixOneSeven Books) whose main character, Walt Steadman, in the winter of 2001 gets wake-up call when he survives a shooting in his favorite Boston café that leaves four people dead. He is a grad school dropout, a sperm donor, and holder of odd jobs. He has not made much of his life and knows it. He becomes entangled with two new relationships; one with an ambitious Harvard undergraduate, Ginger Newton, who is writing a book titled “Girls I Know” about jobs women do and with 11-year-old African-American Mercedes Bittles, who lost her parents in the shootings. He accepts Ginger’s support while tutoring Mercedes and, through the power of human relationships, begins to shape a future for himself. This is a very promising new novelists, well worth getting acquainted with. Booklist has said of Jonathan Tropper that he is “a master of the mid-life male coming of age story” while praising One Last Thing Before I Go ($16.00, Plume, softcover). His previous novels such as “This Is Where I Leave You” have garnered similar praise. In his new novel, Drew Silver is a drummer who has tasted fame just long enough to be ruined by it. His band, the Bent Daisies, became rock stars overnight on the strength of just one hit song. Then their lead singer quit, stranding the ban back home in suburbia. Eight years and an endless succession of mistakes later, Silver is a flabby 44-year-old divorcee scraping by on royalty checks, living alone in an efficiency hotel off the interstate that is filled with other lonely divorced men. Two unexpected events transform things for Silver. The first is that his 18-year-old daughter confides that she is pregnant and the second is a diagnosis that he has an aortic tear that requires immediate surgery. To everyone’s astonishment, he decides to forgo the operation and focus on making the most of his remaining days. Suffice to say this is a very different kind of story and one that will draw you in and keep you there to the last page. Kiss Me Over the Garden Gate by Alexis Rankin Popik ($14.00, Aucoot Press, softcover) is not for the faint of heart. Is is a novel of madness and mayhem in Los Angeles in which Clare Stone’s husband disappears soon after they move there, only to resurface in the emergency room in a manic state. After piecing together the signs of Richard’s bipolar disorder, Clare comes to realize that the man to whom she has been married for 15 years has become a dangerous stranger. At the same time, Clare finds it difficult to resist the flirtations of the attractive gardener she and Richard hired to revitalize their yard. This is a look at the heights and depths of manic-depressive illness as they both struggle to sort out what is real and what is an illusion. That’s it for May. Come back in June for a look at the best in summer reading, fiction and non-fiction. Tell your book loving family members, friends, and coworkers about Bookviews so they too can get the inside edge on the many books that may not be on the bestseller lists, but often deserve to be. Those who are searching over internet matlab assignment help can contact with us now. We are the best assignment writing service provider in melbourne, Australia. Our Academic assignment writers available 24*7 hours for the students, if you really want to need IT assignment help, java assignment help, programming assignment help, r programming assignment help, case study assignment help online at cheapest price and get high distinction grades.